This unique, rustic facility is a real Jupiter treasure. With beach access, the Civic Center's relaxed, old-Florida character lends itself perfectly to any informal occasion. 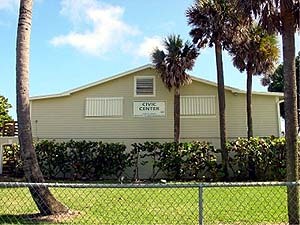 The Jupiter Civic Center, at the northeast end of Carlin Park, is a great place to host your next wedding, reception, birthday party, picnics, family reunions and memorial services. Do not use for 2020 reservations. Only one reservation is booked per day. Carlin Park closes it's gates at dusk. While you have access to the Civic Center between 9AM-1AM, please do not put 9AM-1AM on your lease as this may inhibit your access to Carlin Park. Town of Jupiter events have priority at the Civic Center. All attempts will be made to post booked dates as soon as possible on the online calendar, especially prior to opening day. Rental of the Civic Center does NOT include specific designated parking for your event. All parking in Carlin Park is public parking. If a large special event coincides with your rental please note the Town of Jupiter and Palm Beach County Parks & Recreation are NOT able to designate special Civic Center parking. New Year's Eve, New Year's Day, Easter Sunday, Memorial Day, Independence Day, Labor Day, Halloween, Thanksgiving, Christmas Eve and Christmas Day. Regardless of what photos are available online, there are no outside rentals permitted at the Civic Center nor is drapery permitted to hang from the ceiling. These pictures are out dated and/or in direct violation of the the rental agreement. These policies were changed several years ago and is not something new. Please be sure to READ your Civic Center lease for details. FAILURE TO COMPLY WILL RESULT IN SPONSORING BUSINESS BEING BANNED FROM RENTING CIVIC CENTER.